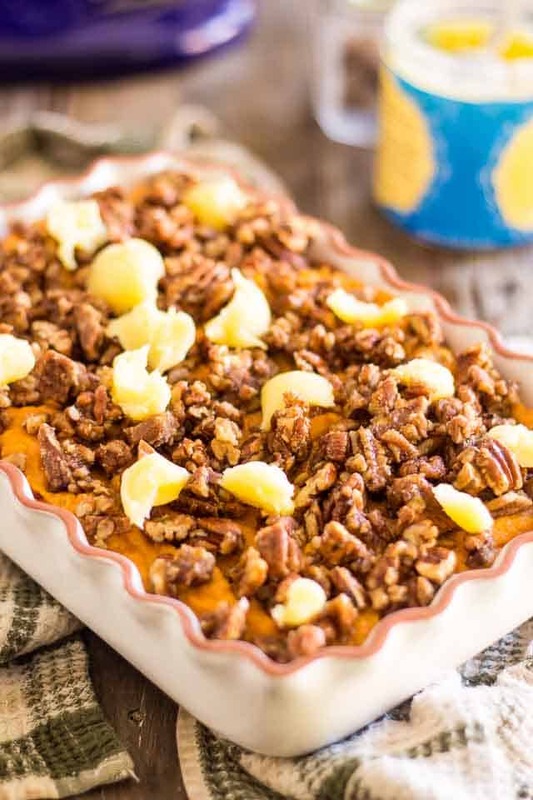 Would you believe me if I told you that before I made this Whipped Sweet Potato Casserole, I had never before experienced the deliciousness that is this great classic. Boy had I ever been missing out! This stuff is out of this world deeeeee-lish! 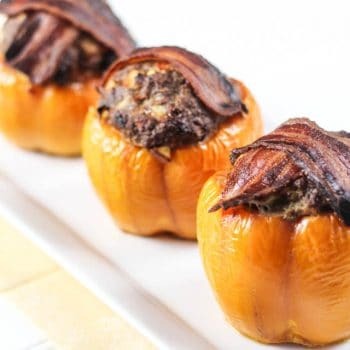 But I dunno, for some reason, the idea of pairing such an extremely sweet dish with savory meat and veggies always kind of put me off, so I was not in the least inspired to whip one up. But then, I got curious (yeah, curiosity always gets the best of me) and decided I had to give it a go. Needless to say I had to peruse the web to get some ideas and inspiration… but, I just couldn’t seem to find THE one recipe that truly spoke to me. And to be honest, I kind of went easy on myself… I’ve seen many so many versions that call for marshmallows, I almost changed my mind. Frankly, I’m really not sold on that idea. I mean, really? 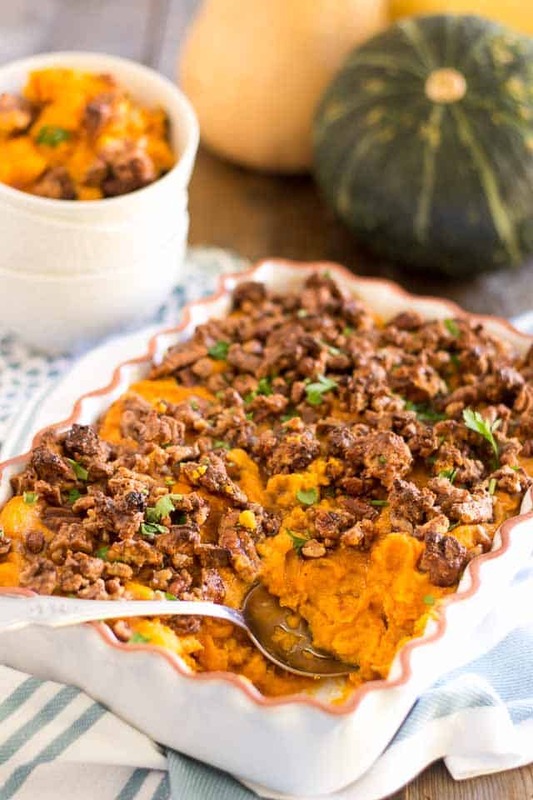 Marshmallows in a sweet potato dish that’ll get served alongside turkey and stuffing? For me, that’s a little bit overboard! Still, I get the feeling that someday, my curiosity will win once again and I’ll end up making a batch of paleo marshmallows just so I can give it a try. But for the time being, I decided to stick with candied pecans… that was plenty “out there” for my taste. Most of the recipes I checked had you peel and boil or steam your sweet potatoes. Ugh! I really don’t care for boiled or steamed sweet potatoes. 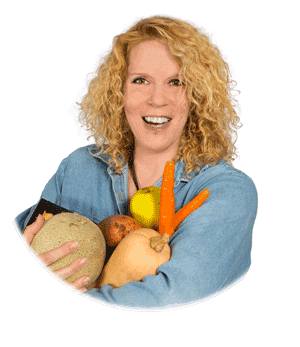 I think they bring up memories from a distant past when I totally disliked sweet potatoes (as in I almost gagged on them) so I’d rather keep those thoughts buried deep and undisturbed. 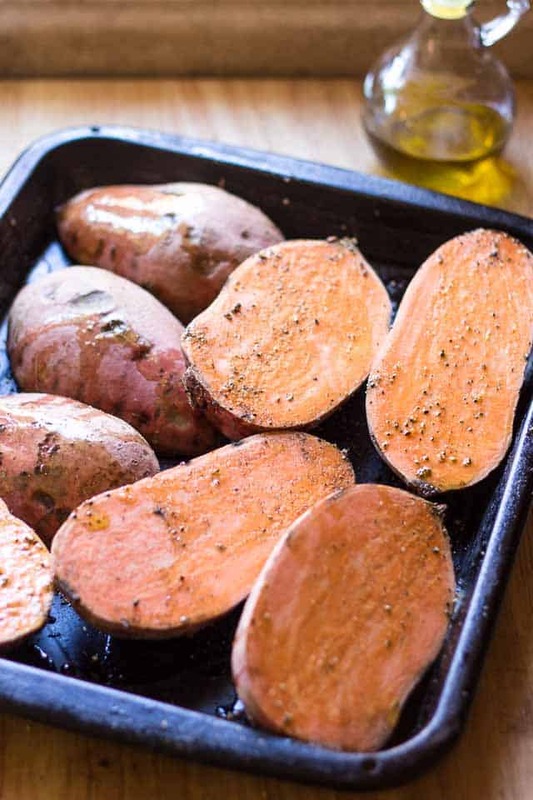 For me, when it comes to cooking sweet potatoes, oven baked is the way to go! For realz, the tubers come out of there so insanely rich and creamy, which is just what you need to make an awesome puree! Baking the sweet potatoes is stupid easy. Simply cut them in half; place them in a broiler pan and then drizzle them with a generous amount of extra-virgin olive oil. Sprinkle liberally with salt and pepper, then turn the tubers flesh side down, cover with aluminum foil and bake in a 375°F oven for about 45 minutes, or until they can easily be pierced with a fork. 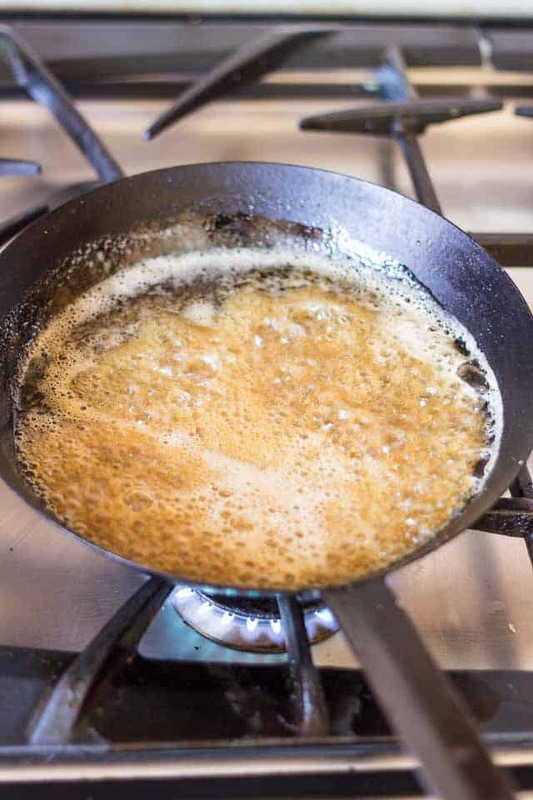 While the potatoes are baking, bring the maple syrup to a boil in a medium skillet set over high heat. Continue cooking for about 2 minutes, or until the maple syrup is practically all gone. Kill the heat and sprinkle the candied nuts with a little bit of salt and cinnamon; stir well and then transfer the nuts onto a silpat or piece of parchment paper. This will help halt the cooking process and ensure that your nuts don’t stick to the pan. 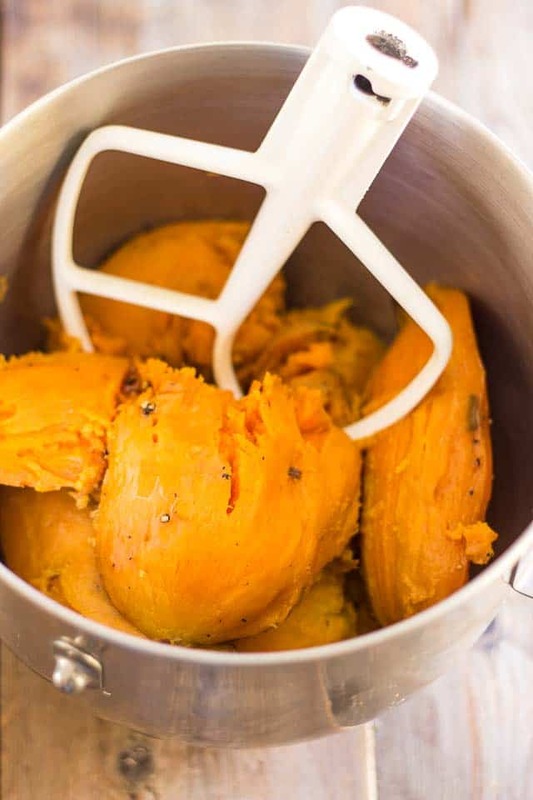 When the sweet potatoes are completely cooked, remove them from the oven (don’t turn it off though, you’ll need to use it again later) and let them cool for a few minutes until you can safely handle them, then either peel them by pulling gently on the skin or scoop the flesh out with a spoon. Frankly, that skin comes off so easily when you pull on it, I think that’s the easiest and most efficient way to go about it. Put the potato flesh in the work bowl of your stand mixer and break it down on low speed using the paddle attachment. 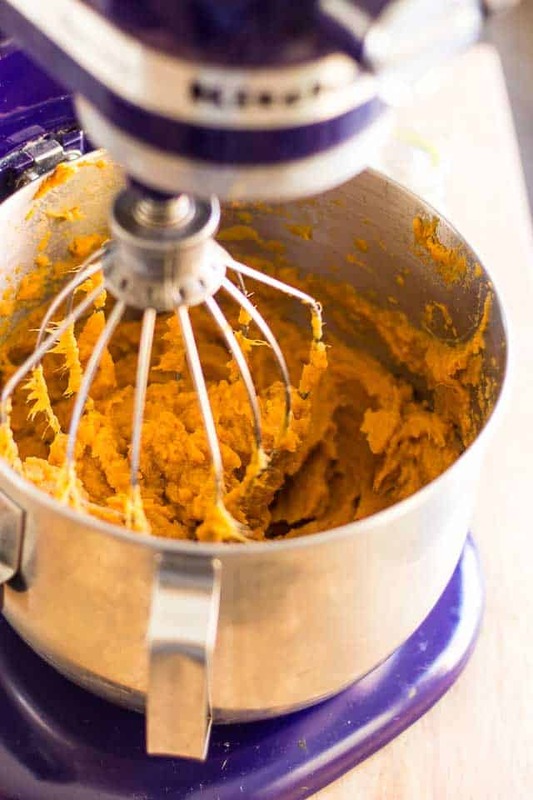 If you don’t have one of those fancy stand mixers, you could also do this by hand with a potato masher. 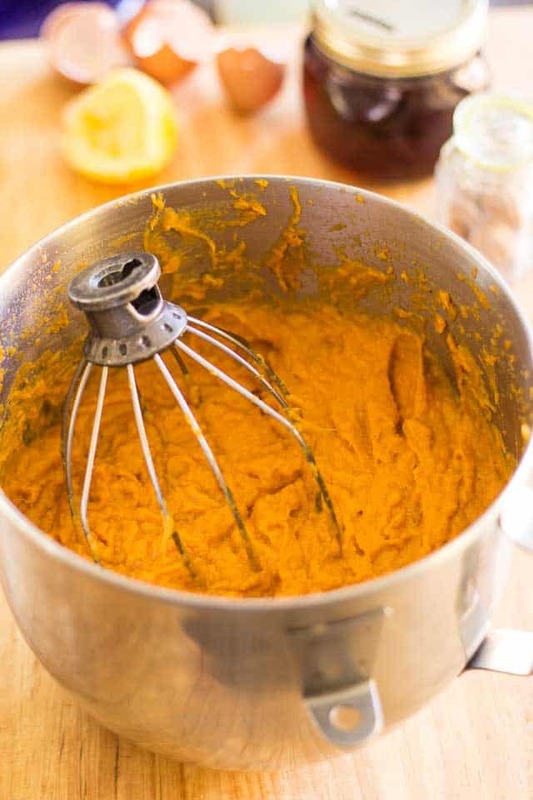 While your potatoes are getting pre-smashed, add the eggs, maple syrup, lemon juice, salt, pepper and nutmeg to a large mixing bowl and whisk until well combined. Trade the paddle attachment for the whisk and give the potatoes a good whip on medium speed. 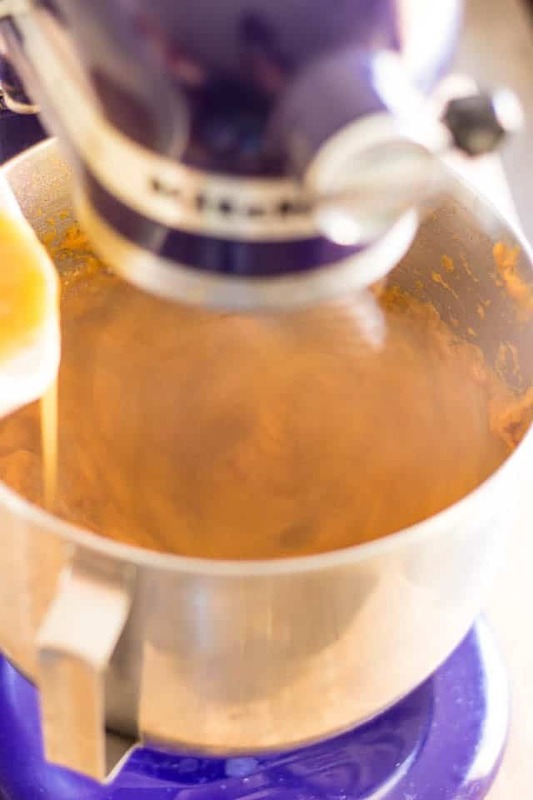 With the motor still running, slowly pour the egg mixture as close as possible to the side of the bowl so it doesn’t hit the beater as it goes down. Again, if you didn’t have one of those fancy stand mixers, you could do this with a hand-held mixer. Make sure, however, that you pour the egg mixture far away from those beaters and that you pour it while the beaters are in motion! Continue whipping the potatoes for about a minute, until they become real light and fluffy. Transfer the mashed potatoes to a ceramic baking dish and spread evenly. …then drop little dollops of ghee all over the top. Return to the oven for 20 to 25 minutes, until the pecans get nice and golden brown. Remove from oven and allow to rest for at least 10 minutes before serving. 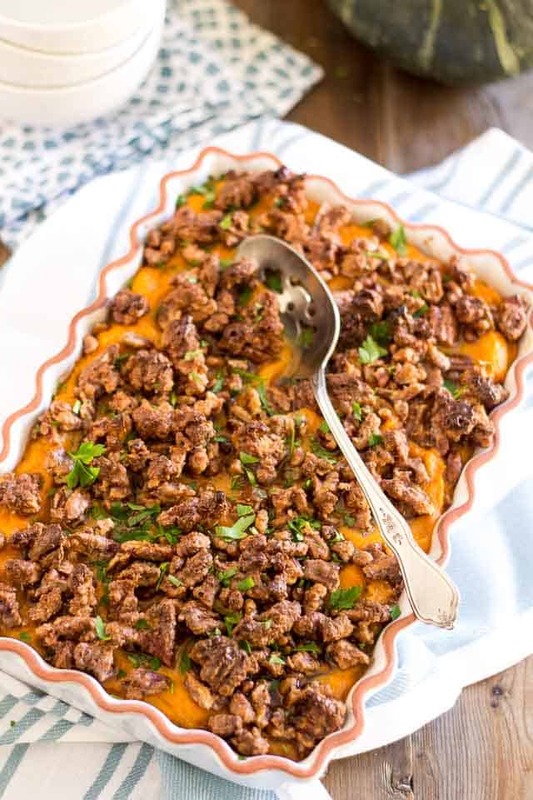 If like me you’ve never tried Whipped Sweet Potato Casserole, I urge you to give it a try now! It’s quite an experience in itself, I swear. The contrast between the silky smooth, creamy, light and airy potato puree and the deliciously sweet and crunchy bits of candied nuts feels purely magical in your mouth. 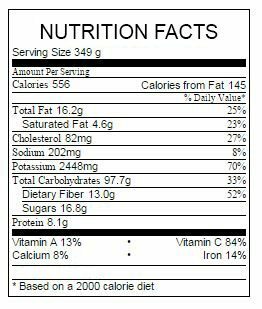 And what about flavor… OH! It’s so intense, so rich, so buttery and sweet, so spicy… so yum, I can’t even find the words to describe it. Seriously. This is a dish that demands to be experienced. I’m not gonna lie to you, it is sweet. Very sweet, even. But by some strange mechanics, it actually works very well served alongside savory dishes, even something as simple as pan-fried eggs! Now, I have to admit that this IS a little bit of a carb overload, but it’s very well worth it, I swear. 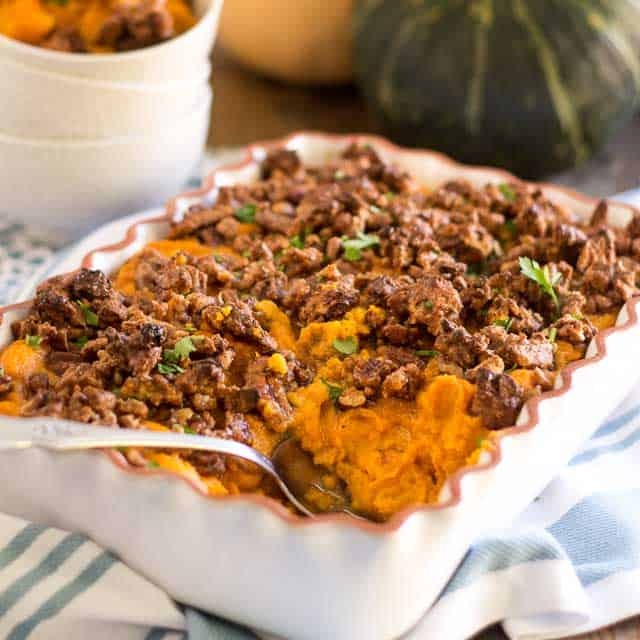 Just don’t go overboard and eat the entire dish (even though I can guarantee you’ll have a very hard time stopping at only one serving) and maybe save it for special occasions, such as Thanksgiving maybe? 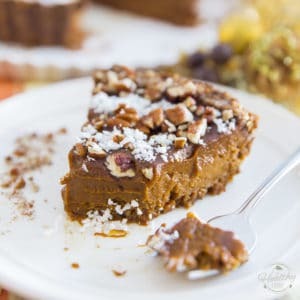 Believe me: just one bite will definitely have you wanting to give thanks, right, left and center! 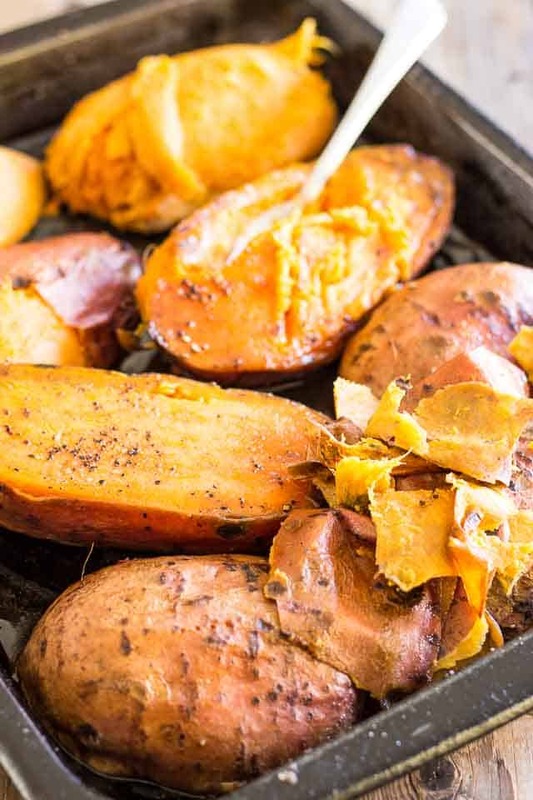 Cut the sweet potatoes in half; place them in a broiler pan. 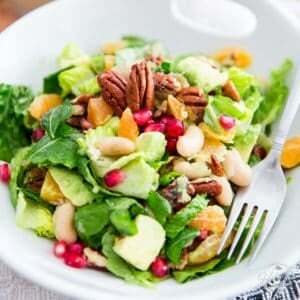 Drizzle them with a generous amount of extra-virgin olive oil and sprinkle liberally with salt and pepper. Turn the tubers flesh side down, cover with aluminum foil and bake in the oven for about 45 minutes, until they can easily be pierced with a fork. Meanwhile, bring the maple syrup to a boil in a medium (carbon steel) skillet set over high heat. 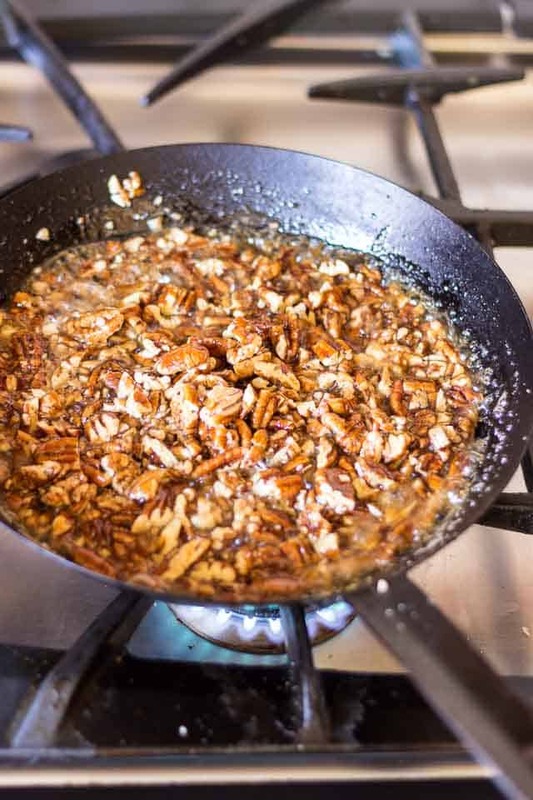 Let it boil for 2-3 minutes, then throw in the pecans and continue cooking for about 2 minutes, or until the syrup is practically all gone. Kill the heat, sprinkle the candied nuts with a little bit of salt and cinnamon, stir well and transfer the nuts onto a silpat or piece of parchment paper to stop the cooking and ensure they don’t stick to the pan. 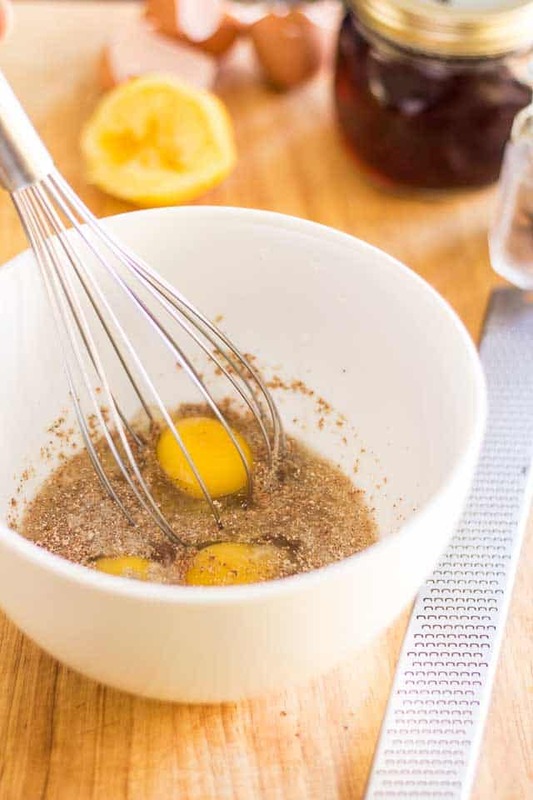 In the meantime, add the eggs, maple syrup, lemon juice, salt, pepper and nutmeg to a large mixing bowl and whisk until well combined. Transfer the potatoes to a ceramic baking dish and spread evenly. Crumble the candied nuts and spread them across the potatoes, then drop little dollops of ghee all over the top. Return to the oven for 20 to 25 minutes, until the pecans get golden brown. 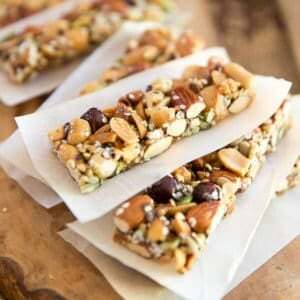 Put some unsweetened coconut flakes in there with those pecans! 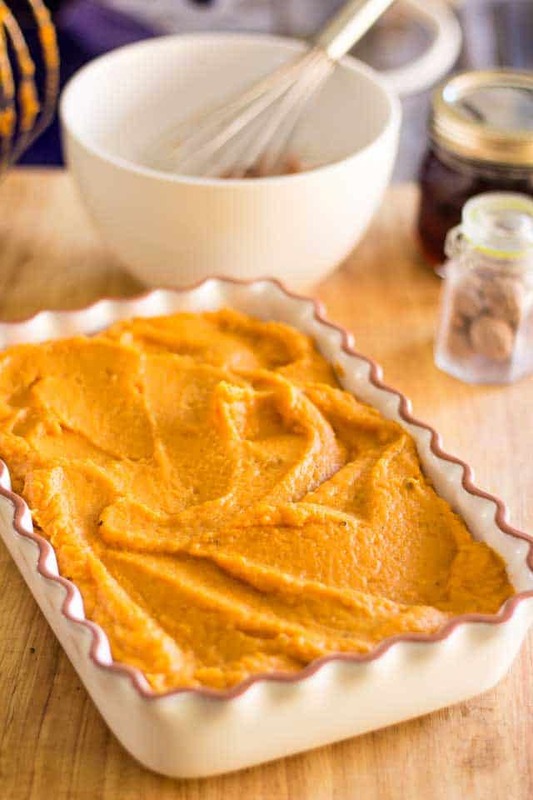 Coconut and sweet potato have a love affair that can’t be beat! Really? I’ll have to try it then, for sure! Thanks for the tip! Made it 99% this way for years. I then decided no need to have eggs etc and no one noticed the difference. I add in pumpkin-type spices. I don’t candy the pecans, I add in some brown sugar with a little butter, but sometimes I make the topping half and half to take places. By that I mean on half I use use plain pecans. I have had people beg me to bring this to get togethers, even in the summer. It goes with anything. I don’t have a stand mixer or an automated hand mixer. I do have a food processor and was thinking of using that to spare myself some work. However, it would be difficult to add the eggs such that they are not in contact with the blades, so I was thinking of omitting them as well. Would you recommend using coconut milk as a thickener? Or any tips on how to incorporate the eggs without them curdling? Could you not feed the eggs through the feeding tunnel? That would definitely work! Thank you so much for this recipe. I cannot wait to make it. I now live in Australia and this recipe makes me home sick for my beloved Canada. Are sweet potatoes not available in Australia, Trish? Yes,, they are available. 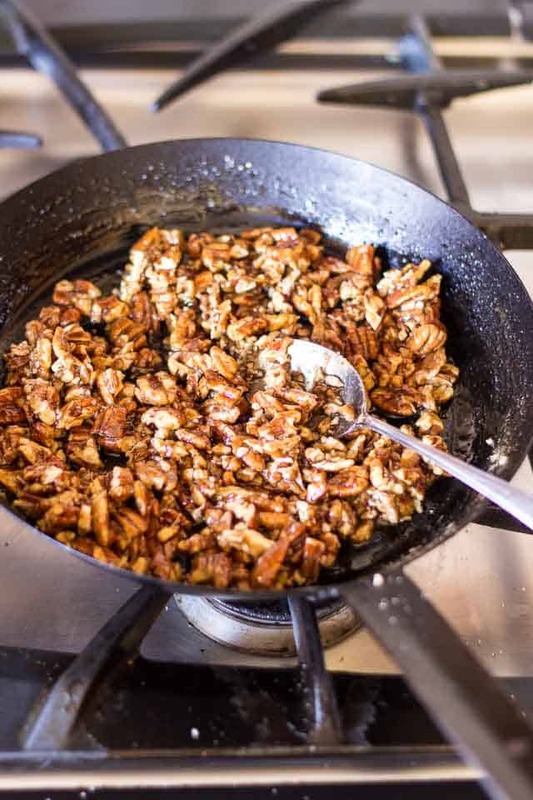 I steam them, bake, them, fry them etc but never thought of teaming them with maple syrup and pecans. Totally with you. This makes for an awesome dessert! So you’re saying I shouldn’t even bother trying the marshmallow thing? 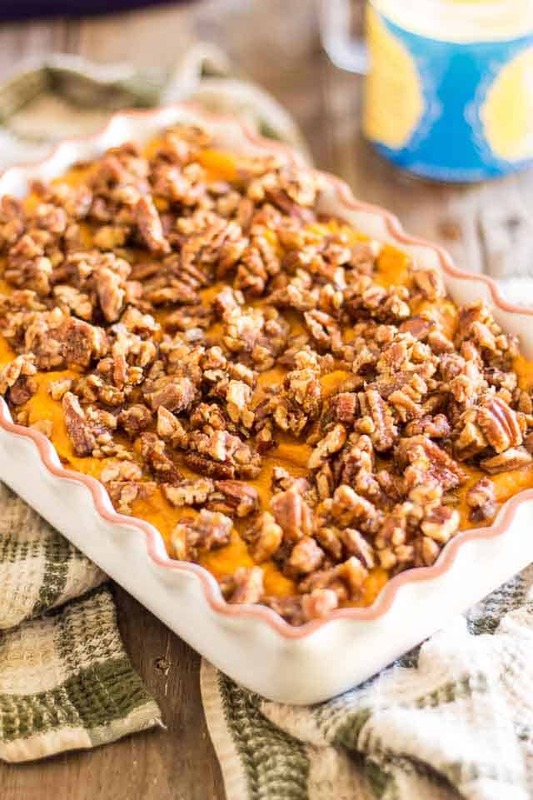 I must admit that it does creep me out too, but then again, so did the whole concept of a sweet potato casserole before I got to taste it. You’re right, though. The texture has to be kind of funky… I guess one definitely needs the crunchy pecans to offset the gooey texture of the marshmallows if they’re gonna add them. Something I’ll definitely have to keep in mind if I ever decide to give it a shot! Do you think I could make the candied pecans a week in advance and store in an airtight container? 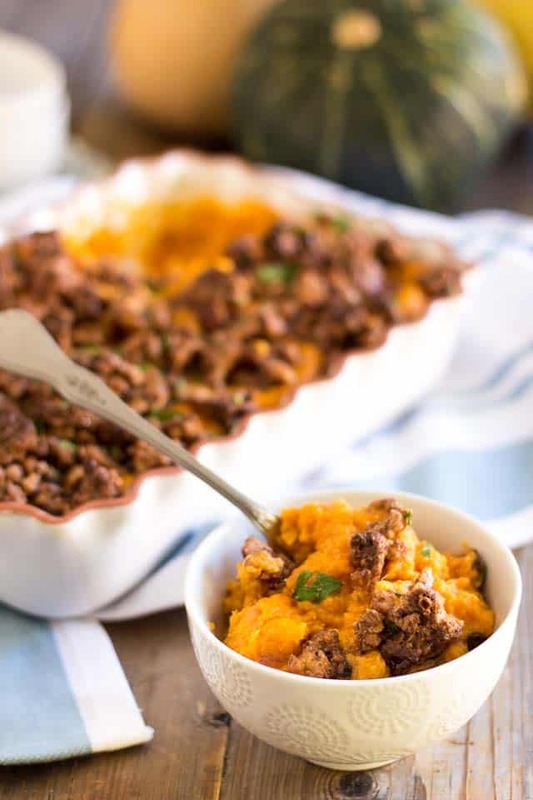 Can this dish be frozen unbaked and then baked from frozen a week or two later? Thanks! 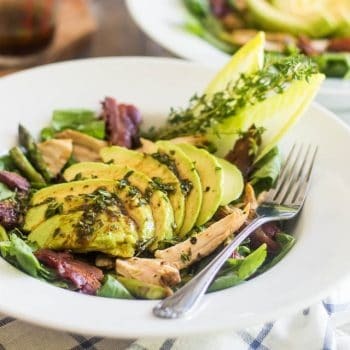 is it fine to make this dish the night before and pop it in the oven the next day? If i did make this ahead of time, would i bake it and then reheat it the next day? Or am i able to leave everything together and then bake the next day? Just put the dish together and delay baking, Mary. Keep in mind that you may have to bake it for a bit longer since you’ll be starting off with a cold dish. 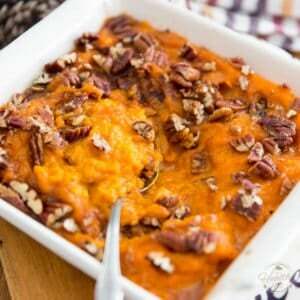 Sweet potato souffle is a very well known dish here in the south. I can’t eat it with my meal but I sure can eat it as a dessert. HA!! My mom had several restaurants in her life time and this was a main recipe she cooked. We don’t add pepper, but she added vanilla extract, crushed pineapple and coconut to the potatoes. Her topping was butter, flour, and brown sugar. I make it without the flour in the topping so it will be GF for some family members. 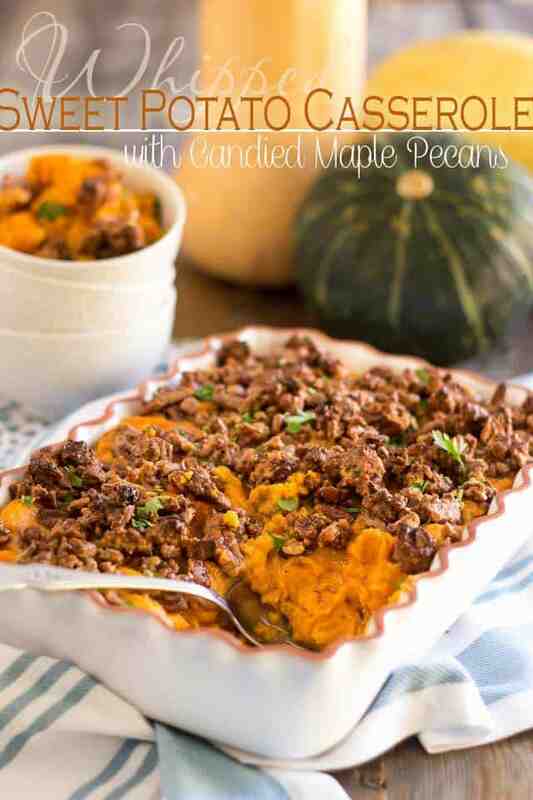 Yours looks delish with the caramel pecans. Good grief!! That would be souffle, crazy auto correct. Also should be delish!! Hahaha! Makes you wish you could edit your own comments, doesn’t it? Wouldn’t that be grand! Maybe they’ll allow it, someday. 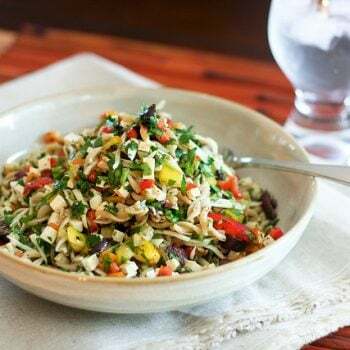 This sounds real good and plan on trying it maybe Thanksgiving. Could you tell me what ghee is. I must be missing something, is it butter? Ghee is pretty much the same as butter, Joyce, the only difference being that it has been rid of all the moisture and milk protein, so all that’s left behind is the fat. You use it pretty much exactly as you would butter, though, so if butter is all you have, then it would definitely work in this recipe.